Kinder Morgan's Trans Mountain marine terminal in Burnaby, British Columbia, May 29, 2018. Canada's Federal Court of Appeal on Thursday, Aug. 30, 2018, quashed the approval of the contentious Trans Mountain pipeline expansion that would nearly triple the flow of oil from the Alberta oil sands to the Pacific Coast. MONTREAL — For years, Canadians have heard a common refrain: If a new pipeline doesn’t materialize to get their oil to market, the oil will just travel a different way — by rail. It’s a trade-off that can inspire fear in a country where an oil-by-rail disaster killed 47 people just five years ago. Environmentalists have sometimes described the rail option as a threat or “boogeyman” looming over Canada’s pipeline debate. But now the prediction appears to be coming true, as the volume of oil traveling by rail out of Canada — to the United States — has surged in the past few months as the country’s latest pipeline project foundered. 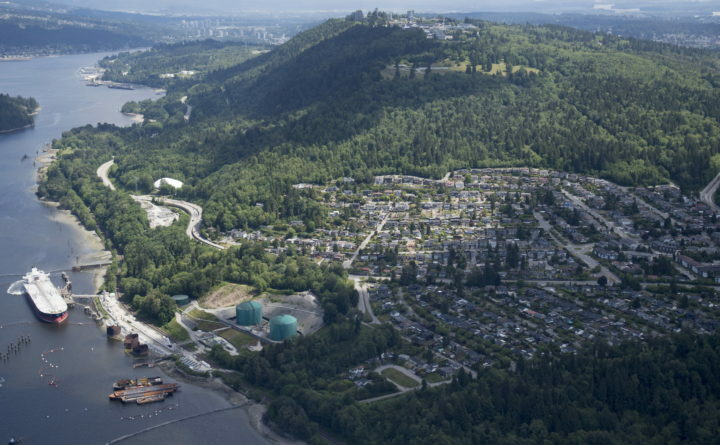 The problems around the Trans Mountain pipeline project have led to increasing pessimism among oil producers and an increasing willingness to invest in rail capacity. That means Canadians are preparing for even higher oil-by-rail volumes over the next few years, while sorting out how their fears stack up against reality. “It’s a storm that’s been brewing for a while,” said Kent Fellows, an economist at the University of Calgary, in the heart of Canada’s oil country. “The risks of spills are higher [by rail], but the fact that this stuff needs to get to market because people are buying it means it’ll search out the lowest-cost pathway,” he said. The spike is dramatic. Before 2012, very little oil was shipped by rail out of Canada. This past June, the country’s energy regulator announced a record-breaking average of 200,000 barrels per day exported that way. The Paris-based International Energy Agency estimates that the 2019 annual average will reach 390,000 barrels per day. But the oil world had been preparing long before this summer. Imperial Oil decided to build a new rail terminal in Edmonton in 2013. Reuters reported in September that another company, Cenovus Energy, signed a new railway infrastructure deal, though the company declined to comment. Several Canadian pipeline projects have failed in recent years, with each defeat bringing more interest in rail transport. Then, this past spring, Kinder Morgan pulled out of an expansion of the Trans Mountain pipeline, slated to send crude overseas via Vancouver. The Trudeau government bought the project, only to see it halted by an Aug. 30 court decision finding that indigenous communities hadn’t been adequately consulted. The government has said it will try again to get the pipeline approved. Despite much opposition to pipelines, polls have found that Canadians see oil-by-rail transport as relatively unsafe. But Fellows said that for those who strongly oppose pipelines, the rail numbers aren’t likely to change many minds; they are seen as necessary to avoid pipelines and guarantee lower transport costs. Patrick DeRochie, of the Toronto-based organization Environmental Defence, has objected in the past to the “boogeyman” of oil by rail. He said in an interview that although he is concerned about the recent increases, rail transport is still “a drop in the bucket” of Canada’s total oil production, let alone its production capacity. “I do think the tragedies that we’ve seen happen … have been used in the media and in the oil industry to fearmonger in communities,” he said. If they must be landlocked for now, Canadian producers are fortunate to be so next to a neighbor like the United States, said Kristine Petrosyan, an analyst with the International Energy Agency. The vast majority of Canadian oil travels south by pipeline rather than rail, most of it to refineries in the Midwest. The refineries get a good price but also have an unusual capacity to handle the heavy crude efficiently. In some ways, Canada is lucky to have a neighbor with enough refining “capacity to deal with the crude that would otherwise be quite challenging to offer an international market,” Petrosyan said. With rail volumes climbing, the Canadian government has hurried new safety measures into place. Last month, it announced that a certain kind of crude-carrying tank car will be phased out by November, moving up a previous deadline by 17 months. “I think in general, the impression [Canadians] have is from the Lac Megantic accident,” Petrosyan said. In 2013, a runaway oil-carrying train exploded in the Quebec town, leveling much of it. In the years since, Canada has passed other regulations to lower the risk of a similar accident. Bitumen shipped out of Alberta, the consistency of peanut butter, is also far less flammable than the crude that exploded in Lac Megantic, Petrosyan said. Still, other accidents have happened in recent years, with the rate of Canadian dangerous-substance rail spills increasing from 2016 to 2017. The same year saw a spike in pipeline spills, too. Research has generally found that transporting oil by rail, while safer than by truck, is riskier than carrying it by pipeline. But some experts say it can be hard to know exactly how to compare those risks, with rail and pipeline transport each coming with safety-related pros and cons.